Aquaguard Superb Review: Aquaguard Superb is offered in 3 variants; Aquaguard Superb RO (Reverse Osmosis)+UV (Ultra Violet)+TDS, Superb RO and Superb UV+UF water purification methods. This enables you to choose the most compatible water purifier based on your needs, while the RO+UV+TDS is an universal device that can purify water from any source, the RO variant is best suitable for bore well water and the UV+UF variant is only suited for tap water. Aquaguard Superb is built with advanced technology and great aesthetics to deliver optimum purification. It is also enabled with triple purification to purify water with great efficiency and a TDS regulator to help you customise the taste of water. Build: Aquaguard Superb is made with high quality food grade, non-toxic, engineering grade plastics. Such plastic is considered nontoxic and BPA free, this keeps the water bacteria free even when stored for longer duration, however, it is not recommended to store purified water for more than 48 hours. Aquaguard Superb is built with flexible installation features, where it can easily be wall mounted without the need of a stand. It also adds on the aesthetics of the kitchen when placed on the counter. The device looks really neat, slim and elegant, thanks to its W260 x D325 x H475 (mm) and the 6.5 liter water tank that doesn’t consume much space too. The body corners are neat, elegant without any wire clutter, sharp corners or gaps between the side panels. The push type water dispenser placed at the bottom of the water purifier feels sturdy and is well built. The net weight of the water purifier varies based on the variant as higher variants have additional filters equipped with the device, the base model Sperb UV weighs 4 kgs and the top end model Superb RO+UV+TDS weighs 6.5 kgs. I’m surprised that Aquaguard Superb doesn’t have an inbuilt stabilizer to handle voltage fluctuations, which is quite common with competing brands. TDS Regulator – Manual TDS regulator that adjusts the water purification process as per the source of water. The high-end version can handle water TDS levels up to 2000 ppm with average water recovery of approximately 25% (that means 25% of water is purified e.g. 100 liters of input water can yield 25 liters of drinking water), this is on par with many domestic water purifiers, however, A.O Smith and Blue Star water purifiers can recover water up to 30%. Purified water flow rate is impressive at 15 liters per hour and has a maximum capacity of over 280 liters per day. The 11 W UV lamp isn’t really powerful but just sufficient and has a life of 5000 burning hours. The manual TDS adjuster in this water purification system balances the TDS of water at the required equilibrium which is approximately 500 mg/L, removing all the excess impurities while maintaining the natural taste of pure water. Design: Aquaguard Superb is one of the most stylishly and aesthetically designed water purifier from Eureka Forbes, it is nice to see manufacturers focusing on the design aspect as most of the consumers do not want to a spoiler hanging around in their expensive kitchen. Aquaguard Superb looks tall and neat with the black front panel, the device is easy to use and the intelligent alert interface indicates the different functions of the water purifier, like purification process, service alerts and more. Given its high price point, lack of a digital LCD/LED screen may not go well with many consumers. The manual water flush port is thoughtfully placed below the water purifier and it doesn’t show out to make the device look clutter free. Service & Price: Eureka Forbes is one of the largest and oldest water purifier brands in India and is well known for its PAN India service network, however, with growing demand for water purifiers, the service satisfactory levels have drastically dropped in many towns and cities if not all of them. Many consumers are venting their anger on social media and other e-commerce portals for poor quality of service, but, if you are living in any of the metros, any good local technician can fix the device. Eureka Forbes offers AMC (Annual Maintenance Contract) at different price points starting from ₹ 2,000 to ₹ 5,000 wherein you get 2 periodic services plus any replacements if required, this can be a ripoff if the service network isn’t great at your place. 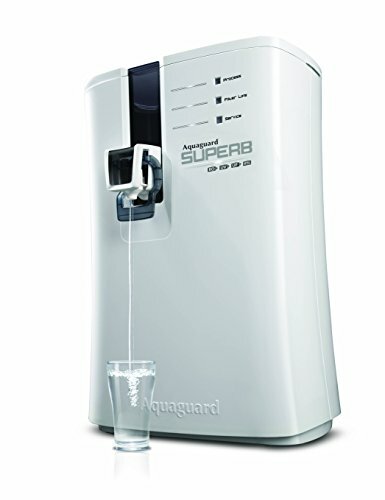 Aquaguard Superb is retailing at ₹ 21,999.00 and is available online at Amazon.in from ₹ 18,194.00, customers are eligible for the same manufacture warranty and free installation when purchased online. Conclusion: Aquaguard Superb is a stylishly designed and technologically advanced water purifier from Eureka Forbes. Built on the next-gen aesthetics and sporting a modern design that adds to the decor of your kitchen and your home. Equipped with dual RO+UV technology, with a manual TDS regulator that gives you pure water with great taste. The device by no means is superb, just an ordinary product with good looking exteriors and basic alert system. I would recommend buying this only if you are picky about Eureka Forbes water purifiers, else, stay away and there’s plenty of choice out in the market from Blue Star, A. O.Smith, Pureit and other brands at better price and service levels. Check out our top 10 rated water purifiers in India.